Emergency services were called to the A823 (M) Rosyth Road in the early hours of Saturday. A man has died after being hit by a Royal Mail van on a road in Fife. 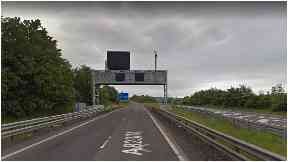 The incident happened on the A823 (M) Rosyth Road near to Junction 2 in the early hours of Saturday morning. Emergency services were called out to the scene at around 12.35am. A 45-year-old man was pronounced dead at the scene. The road was closed to allow officers to investigate before reopening at around 7am. A Police Scotland spokesman said: "At around 12.35am this morning police and other emergency services attended a road traffic collision on the A823 (M) Rosyth road near to Junction 2 whereby a 45-year-old male pedestrian sustained fatal injuries." A Royal Mail spokesperson said: "We are aware of the tragic events that occurred in the Fife area on Saturday morning. "Our thoughts and condolences are with the families and friends of those involved. "We are assisting the relevant authorities and cannot comment further while the investigation is underway."